History/Mythology: Mooralla Smoky Quartz only comes from one area in the world at Mooralla Victoria Australia. Mooralla are double terminated smoky quartz that are found in Geodes of Ryolite (Rain forest Jasper) that over time and pressure have compressed most of the Geodes and left double terminated points and clusters for the main part. 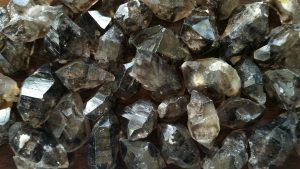 Mooralla Smoky Quartz is a very high vibrational stone and gives off a wonderful and intense energy due to it ‘Herkimer’ like formation. It is an excellent stone for grounding and protection, especially when you are feeling highly stressed. It helps to eliminate and detoxify the body on all levels. It also assists in easing fear and helps to lift depression. It is a wonder calming stone and assists you to feel more centered in where you are at. Smokey quartz helps us to achieve a seen of acceptance with who we are and our own physical bodies. Can be used in all meditations particularly when cleansing and healing the body.